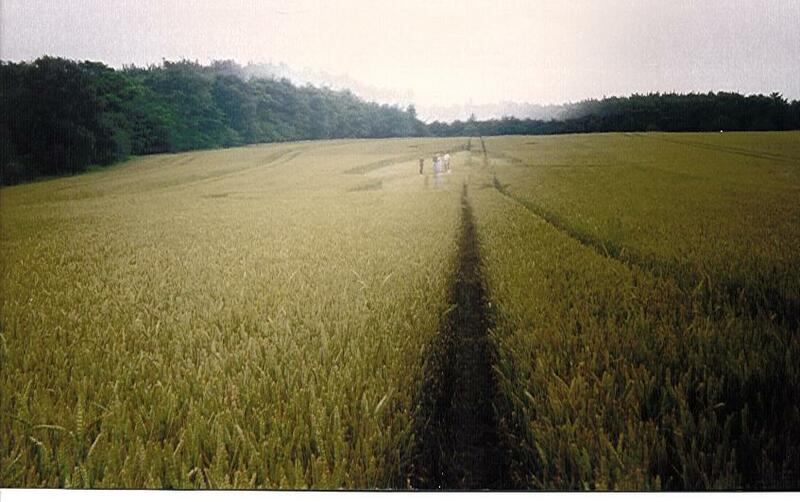 The following photos were taken by me in 1992 when I was a member of the Argus Project that went to England to study crop circles. I was invited to be a part of this scientific inquiry because the previous year I had done some radioactive analysis on a number of samples from crop circles and found that in one circle a number of inexplicable radioisotopes were present that are not naturally occurring and had a relatively short half life. In a paper that I coauthored with Michael Chorost I proposed that the isotopes had been created by bombardment with high energy deuterium (heavy hydrogen) particles. Such a source of particles is not known to exist in nature. While there I took many pictures of crop circles. A number of the pictures showed anomalous effects, primarily what appears to be vertically aligned energy bands of some sort. The effect appeared to be the "beating" of two energy fields, creating bands in the silver of the negative which were alternately more and less sensitive to exposure. Another possibility is that the focal plane shutter was affected by some type of field. (Thanks to john Cook for some ideas along this line) If the speed of the opening or closing shutter varied, it would produce these affects. 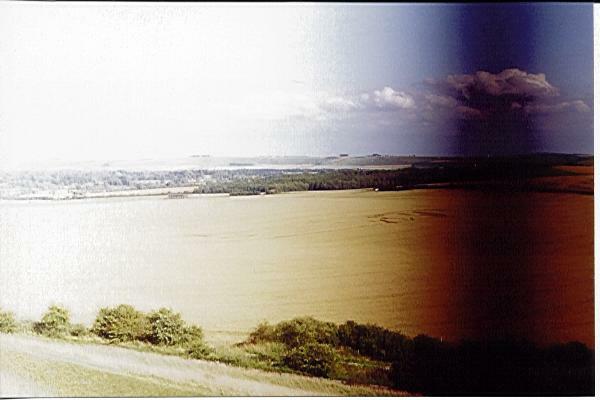 However the camera took thousands of pictures both before and after these photos, and was checked after the return from England, and the only pictures that ever showed this effect were those shown here. The last two pictures indicate something far more bizzare going on. It appears that in that case there was some type of dimensional shift affecting both space and time. If such is indeed the case than any such ripples in the shift would likely cause the effect by making the shutter appear to have a ripple in it's movement, or affect the ASA of the film when viewed from outside the ripple, or even if in a different phase of the ripple. The camera used was a 35 mm Canon AE1 Program. Settings in all cases were in the "automatic program" setting, so I do not have any information on shutter speed or f stop. 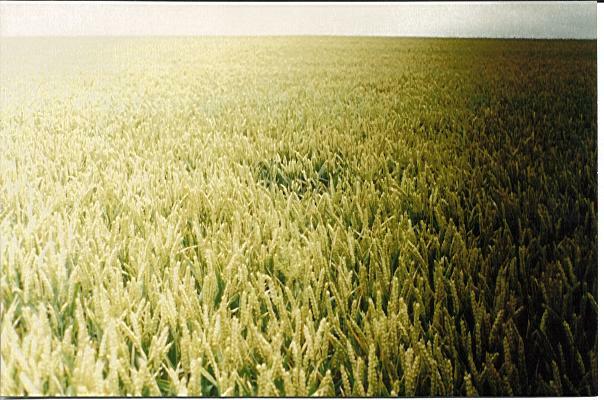 Over 1,000 photos were taken by the camera both before the pictures of the crop circles, as well as after and none ever showed any sign of the effects seen in these photos. Please note that these photos are copyrighted by me and permission must be obtained from me before reproducing them elsewhere. This first photo does not show any anomalous artifacts, but shows the beauty and flow of a typical formation. This was the Milk Hill formation from 1992. This photo is from the edge of the huge Snail formation in the East Field at Alton Barnes. The photo was taken of a small circle away from the main formation showing that there were no trails to the circle, an indication it could not have been made on the ground by hoaxers. When the film was developed the left side of the negative was found to be overexposed and the right hand side was found to be underexposed. This next photo was taken from a hill almost exactly half way between the snail formation in the East Field, which you can see in the distance, and the milk hill formation above. The dark band is in the same general area as the dark side of the previous picture, thus suggesting that perhaps the banding is not necessarily due to an energy interference, but maybe some energy being focused on the film that is changing the ASA of the emulsion. This next picture was taken of the horse on the hillside right outside of the house we were staying in in Alton Barnes. Once again the snail formation is to the right and the milk hill formation is to the left. This picture seems to confirm that the effect is caused by some type of energy interference from energy from the two formations "beating" against each other. 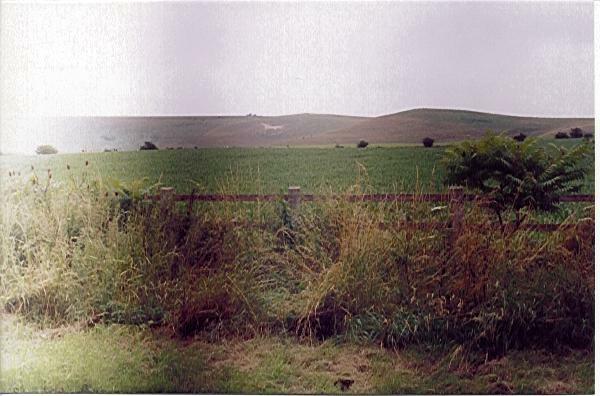 The following picture was taken in the Avebury circle of 1992. The effect is much less pronounced than in the other pictures, but there is a dark band on the left half which is more easily observed on the negative. There were no other formations near that one at the time I am aware of, but that formation was comprised by multiple circles, so this does not totally rule out the possibility of interference between energies from different circles. The following pictures were given to me when I was in England in 1992 and had expressed an interest in anomalous photographic evidence. Unfortunately I do NOT own the copyright to these photos, and lost the information on who took them. If anyone knows who took any of the following photos, please email me at mdudley@execonn.com with information on how to contact them, or have them contact me. All the following pictures have a large X inserted in them to prevent unauthorized reproduction since I do not have the copyright on them. If I can acquire permission to post the pictures unaltered by the copyright owners, I will post the images I have without the X. This picture shows what appears to be vertical energy bands. There is some possibility that this was caused by winding the film backwards. 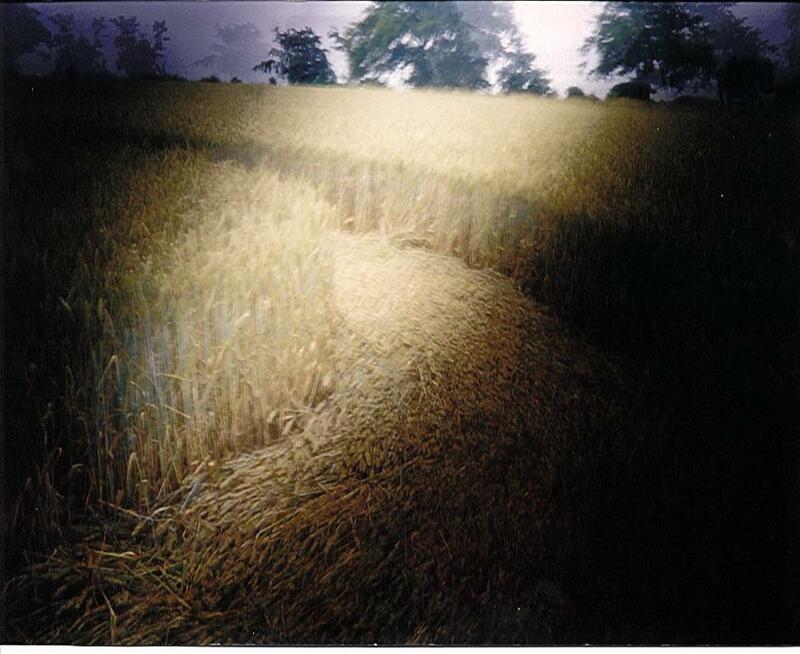 It is similar though to other photos that claim to be of an interdimensional doorway. These can be seen at http://www.cyberspaceorbit.com/interdimern.htm. The following photo shows the same type of anomalous bandings seen in the ones above. The formation is tentatively identified as Lurkeley Hill, East Kennett 1992, but we still don't know who the photographer was at this time. 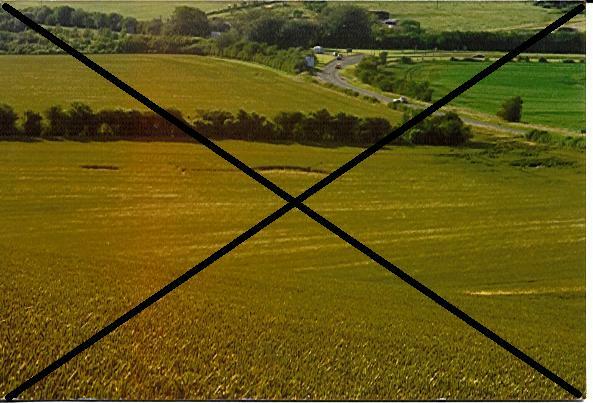 Note that if the banding was caused by a camera problem, then the these two photos would not be expected since they were taken by different cameras. The following 2 photos show time and space anomalies. They were taken by John Holman (and are copyrighted by him) and who has gracously given us permission to post them on this page. 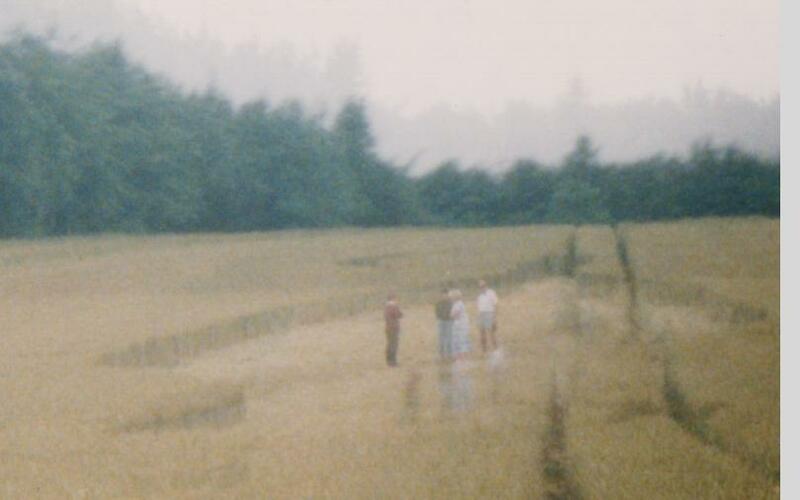 The first photo believed to be from West Woods in 1991 shows what at first glance appears to be a double exposure. But this is ruled out due to the fact that only the area above the formation is double exposed! There is not only a slight shift in picture between the two "exposures", but if examined closely you will find there is also a shift in time. Although difficult to distinguish in this jpeg, if the original picture is examined with a magnifying glass, the positions of the people are different between the two exposures. The person on the left has actually stepped toward the others in the lower image and instead of having his back to the camera, appears to be facing toward the camera and slightly AWAY from the others he has stepped closer to, and has his legs apart. (see next photo). The "double exposure" does not occur in the area on either side of the formation, and not "below" it (that is actually toward the camera), but just directly above it. The following is a blow up of the center section which shows that there is a time difference between the two images. It was scanned at a higher resolution of 360 per inch, instead of 100. This last photo shows both effects, the banding of the earlier pictures, as well as a dimensional shift. If you examine this photo carefully, you will notice something very strange. The very center of the photo appears to have no shift at all, but the ghost image on the left side has shifted left and on the right side has shifted right. At first glance this might appear to be a double exposure in which a the F stop and zoom were adjusted between the photos. But this cannot be the case for several reasons. First, the zoom only shows up in the horizontal direction, not the vertical. Second the far left side and far right side of the image, the ghost is indistinguishable from the "real" part, so exposure of the ghost would have had to be changed between the two exposures, as you go across the film. 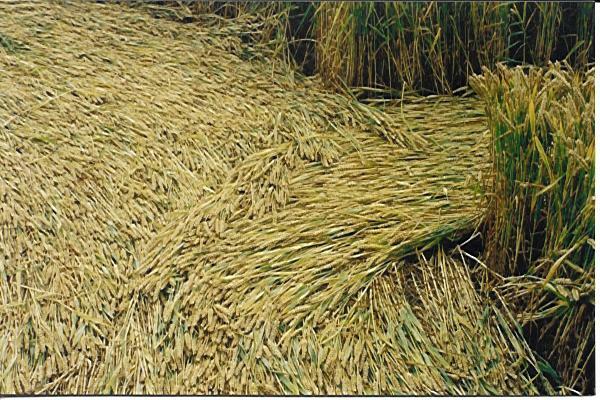 It appears that these are truly anomalous effects of the crop formations, or the process by which they were made, or are being monitored. 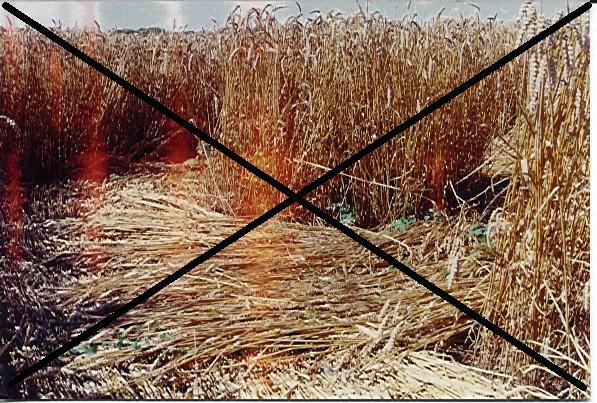 Perhaps these photos can offer some additional information that may help solve the crop circle mystery. 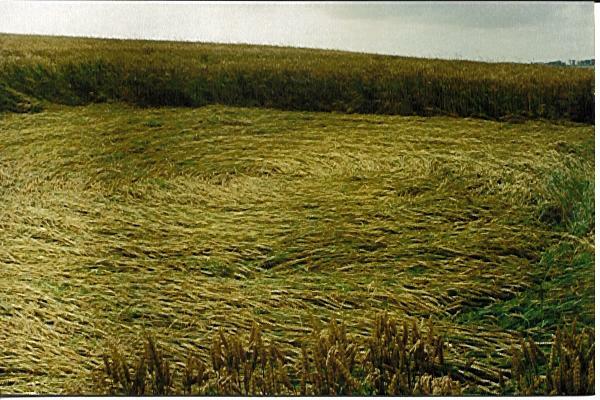 For those wishing an analysis of the statistical analysis of hoaxed vs genuine crop circles, see the article at http://www.execonn.com/cropcircles/hoaxes.html.